I read this article and found it very interesting, thought it might be something for you. The article is called Skilling Rural Youth Gets Rs 1,500 Crore Boost and is located at https://archive.indiaspend.com/budget-2015-modis-moment-of-reckoning/skilling-rural-youth-gets-rs-1500-crore-boost-23497. Finance Minister Arun Jaitley announced the creation of a separate ministry for skill development of rural youth and allocated Rs 1,543 crore for the year 2015-16. Jaitley, while presenting the first full union budget of the Bharatiya Janata Party-led government, highlighted that less than 5% of India’s potential work force gets skill training to be employable. IndiaSpend had earlier reported, that only 2% (nearly 9 million) Indian workers are formally skilled. And only around 7% of the population above the age of 15 years receive vocational training. The average age of the Indian youth is expected to be 29 years by 2020, the lowest in the world. While it is said that the world will experience a shortage of young population by around 56 million by 2020, India will have a surplus young force of 47 million at that time. The government under the skill development and entrepreneurship scheme has launched Kaushal Vikas Yojana (Skill Development Programme) allocating a sum of Rs 1,350 crore. A separate allocation of Rs 150 crore has been made for the North East Region under the plan. The government also plans to enhance the employability of rural youth under the Deendayal Upadhyay Gramin Kaushal Yojana. The DDU-GKY scheme was earlier known as the Aajeevika skills or National Rural Livelihood Mission under the Ministry of Rural Development. 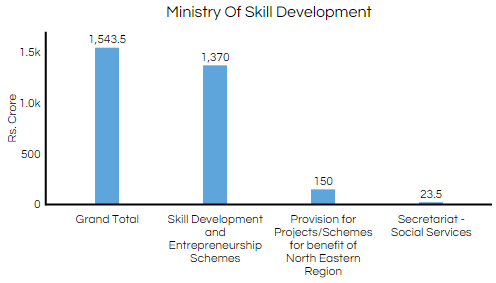 Let us look at the budgetary allocations for rural skill development schemes since 2012-13. It is interesting that the government plans to enhance rural employment through skill development but the budgetary allocation has declined over the years. 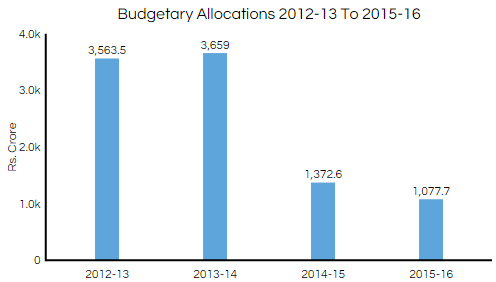 The allocation has declined by 30% from Rs 3,563 crore in 2012-13 to Rs 1,077 crore in 2015-16. According to National Skill Development Corporation (NSDC), a public-partnership (PPP) initiative aimed at promoting skill development through for-profit vocational institutions, here is requirement of 120 million skilled personnel in the non-farm sector between 2013 and 2022. Let us look at the number of candidates trained and employed in the last three years under the programme. In the last three years, over 400,000 candidates have been trained of which 300,000 have been placed under DDU-GKY. Andhra Pradesh is the leading state to have trained over 100,000 candidates followed by Odisha with 41,000 candidates. 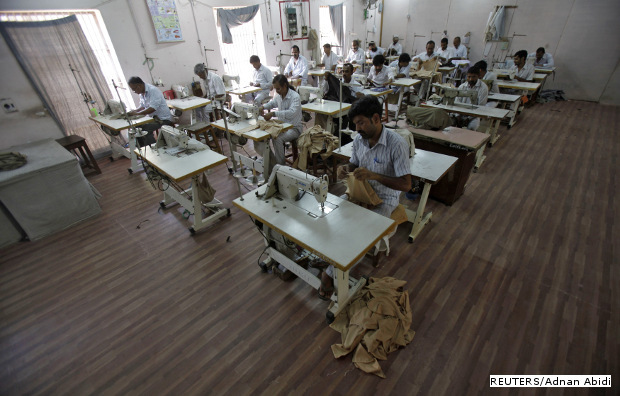 Of these trained, Andhra Pradesh could provide jobs to just 68,000 and Odisha to 28,000 youth. It is also interesting to know that around 20 ministries and departments of the central government are implementing 73 skill development schemes for youth. IndiaSpend had earlier reported that 7.6 million people were trained under various government ministries and departments in 2013-14. So, it would be interesting to see how the government multiplies the required skilled force by 2022, now that it has created a new Ministry for Skill Development. Kaushal Vikas Yojana – this scheme will focus to up-scale and align skilling initiatives of the country. Under this scheme, various skill development and entrepreneurship activities/sub-schemes will be funded to suit the needs of the economy and society. Deendayal Upadhyay Gramin Kaushal Yojana– this scheme allows skilling in a PPP mode and assured placements in regular jobs in an organisation not owned by the skilled person, including foreign placements, placements by Champion employer (with assured career progression), placements through industrial internship, and placements on completion of long-term skilling courses. Looks like teh budget has been reduced this year .